In his influential 1954 article, Lindsay Anderson anointed the quintessentially English filmmaker Humphrey Jennings as “the only real poet the British cinema has yet produced” (1). Like many other filmmakers of abundant talents and interests, Jennings is a difficult to place filmmaker whose greatest work was completed over a short period of time, stretching from the very last days of pre-war peace (Spare Time, 1939) to the first stumbling days of post-war reconstruction (Diary for Timothy, 1945). Most critical accounts of Jennings’ work single-out three of his extremely evocative portraits of Britain at war – Listen to Britain (co-directed by Stewart McAllister, 1942), Fires were Started (1943) and A Diary for Timothy – as his greatest achievements, the rest of his films regarded as either primarily preparatory or interesting failures. Nevertheless, in his recent biography of Jennings, Kevin Jackson rightly expands the canon of Jennings’ best work to include The Silent Village, an extraordinary combination of documentary record/style and fictional hypothesising that imagines both the German invasion of Britain and the obliteration of a small Welsh village in retaliation for its inhabitants numerous acts of resistance, including their involvement in the assassination of Reinhard Heydrich, second-in-command of the S.S. (2). Like most of Jennings’ films, The Silent Village presents an extraordinarily sympathetic portrait of community. But whereas Listen to Britain, a virtually wordless hymn to the everyday strength of the British people, presents a musical, sonic tapestry of the nation, The Silent Village is much more concentrated and intimate in its focus upon a regional working class mining community. The film’s dominant use of Welsh choral singing underlines this culturally and geographically specific emphasis. The Silent Village is also, like Fires were Started, a much more collaborative and interior vision of a particular group than Jennings’ earlier work (such as Spare Time and Heart of Britain ). This revealing statement underlines both Jennings’ leftist political allegiances and the developing, more enveloping nature of his filmmaking practice (though this film was more distanced than the previous Fires were Started, appropriately so considering the ultimate chilly fate of its characters). Thus, The Silent Village brings together four of the key preoccupations that mark Jennings’ work: the documentation of tight-knit, distinctive communities (expanded in scope by the “common goal” of World War II); a fascination with the working class; the exploration of the connections between classes and cultural forms; the effects of modernity, machines and industrialisation on specific communities and the landscape (and Jennings work seems much more comfortable when dealing with towns, cities or communities forged around industrial practices than more traditional rural scenes and settings). The Silent Village is ultimately a remarkable and groundbreaking fusion of documentary, poetry, portraiture and fictional storytelling. The Silent Village was made to memorialise the people and village of Lidice in Czechoslovakia, a mining community with many similarities to Cwmgiedd that was obliterated by the Nazis in retaliation for the actual assassination of Heydrich on 10 June 1942. The film is thus a timely act of solidarity but it was also made to bring home the distant realities of the brutal fascist occupation of Europe (its Central and Eastern regions in particular) to the people of Britain, and to see and explore their direct connection to communities elsewhere (the choice of a somewhat far-flung Welsh village is also pertinent here, particularly to an often solipsistic England). The film is also an act of solidarity in the sense of linking together two industrialised, unionised communities that shared leftist sympathies. Cwmgiedd was chosen as the setting because of its supposed physical resemblance to Lidice as well as its similar social history, economic reliance on mining, and broadly shared political allegiances. Thus, the involvement of the people of Cwmgiedd in the film’s fictionalised resistance activities, and the demonstrated hostility of the occupying forces towards it, is granted a greater emotional charge and sense of authenticity. Like all of Jennings’ wartime films, The Silent Village is also aimed at providing a partial answer to the question of what Britain was fighting for. Like Kevin Brownlow and Andrew Mollo’s similarly themed but much more nihilistic It Happened Here (1964), The Silent Village attempts to imagine what might have happened if the projected German invasion of 1940 had actually occurred, but its potency is amplified by the close historical proximity of these imagined events and the urgencies of such sympathies. Like all of Jennings’ greatest work, The Silent Village provides an extraordinarily detailed portrait of how daily life was lived and of those who lived it. The film starts with a title-card telling us of the “story of the men of Lidice”, all of who were executed before the village was destroyed and subsequently erased from the map. The film then moves onto, for Jennings, a typically associative and combinatory collection of shots that provide a complex but poetic portrait of the workings of Cwmgiedd. Starting with an image of the stream that runs through the village, giving it sustenance and connecting it to other such villages and the broader nation, the film then combines this with images of the inhabitants singing in Cwmgiedd’s spare Methodist church, working in the colliery, and labouring at home. Unlike some of Jennings’ earlier work, the film does not sustain an objective, observational distance, but moves constantly from such a perspective to a closer and more connected view. Most of the film’s shots are quite static in composition and framing, as is typical of Jennings, and in-frame composition, associative editing and sound create the film’s key movements and associative ideas. The first seven or eight minutes of the film present something close to a travelogue, a beautifully rendered portrait of shared life in a small western Welsh village in the Swansea valley. This initial section presents a remarkable fugue of everyday actions and sounds. Like Listen to Britain, much of the emphasis and meaning of The Silent Village is placed on the soundtrack, singing and spoken language in particular. Almost all of the dialogue of this first section is in untranslated Welsh, and this provides an important pointer towards both the film’s overwhelmingly respectful intentions – and care in giving a true sense of a place and its people – and a key site of tension once the German occupation occurs. Sound and its quality remain important motifs throughout the film. After this opening stanza, which concludes with a title-card summarising that “such is life” in this Welsh village, the fictionalised German occupation is introduced by the slow, funereal, Wagnerian movement of a black car over a bridge and into the village (which blares out triumphal marching music). Mostly this occupation is heard rather than seen: through the amplified sound of speaker and radio, or the threatening sound of marching boots or gunfire. Only fleetingly do we ever see German troops, and the menace of this initial figure of a modern car – immediately seen in contrast to a more prosaic horse and cart – is predominantly produced by the amplified sound emanating from the loudhailer on its roof. The suggested and inevitable violence of this occupation is first indicated by the harshness of words and accent that emanate from the loudhailer, its amplified obliteration of the other sounds of the village, and the quick, successive movement from Welsh to German to English that it enacts and imposes. Gradually, and not surprisingly, the distinctiveness and identity of the Welsh people is then systematically destroyed. The voice is the key territory where we see and hear this destruction taking place. Welsh is no longer allowed to be taught in schools, and union activity – predicated on class action and workers speaking with a single voice – is outlawed and deemed “unnecessary” to the fascist state. 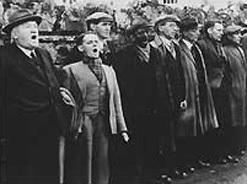 The last refuge of this resistant voice is heard as the men of the village heartily but hauntingly sing their way to their death, lined up and executed along the wall of the village’s churchyard (but the volume and unity of this voice makes an arresting impression upon us). The film’s title is in many ways ironic, as it is the sound of the village rather than its silence that is perhaps the key to its resistance. Nevertheless, as in many of Jennings’ richest films sound creates a dense and evocative tapestry of communal life that is, in this instance, gradually silenced by the occupying German force. The village does indeed fall silent but it is a key purpose of the film to memorialise the truly organic, collective and resistant “voice” it once spoke with. It is probably most instructive to see the combination of documentary and more poetic, often associative effects, as well as fiction and actuality, in The Silent Village as the refinement of Jennings’ work on his two previous films. While filming The Silent Village in the last four months of 1942, Jennings was also engaged in the final editing of his feature-length opus, Fires were Started, a strikingly “recreated” portrait of fire-fighters at work during the blitz. This prior film is remarkable for its use of actual fire-fighters as its central actors, its focus on small, everyday details, and its ability to provide a living sense of these figures’ often-tenuous existence. This extraordinary naturalism – though a little less obvious when watching his films now, over 60 years later – is the result of the efforts Jennings and his crew made in working and living with their subjects. For example, much of the power and resonance of The Silent Village is generated by the close proximity between what is represented in the film and the life of the community itself. All of those who acted in the film were inhabitants of the village – though some others were excluded due to shyness or a lack of confidence in front of the camera – many fulfilling the same roles they actually completed in everyday life. This fidelity to people, place and everyday existence is combined with the more poetic, associative and musical/rhythmic form perfected in Listen to Britain. The Silent Village is an unusual film, particularly in the context of wartime film production, but it does share some qualities with several earlier works. Jennings himself mentioned John Ford’s The Grapes of Wrath (1940) and How Green was My Valley (1941) as important reference works and points of departure, obviously seeing a connected interest in the working class and the effects of industrialisation, as well as a preference for tableau-like compositions and an almost musical structure (5). How Green was My Valley provides the most obvious point of comparison, as it is a contemporaneous work that also memorialises a Welsh mining village, and relies heavily on the choral qualities of the Welsh voice to maximise its emotional impact. But the sentimentality, nostalgia and “theatricality” of Ford’s beautiful but dream-like film are far from the explicitly modernist and considerably more “spare” sensibility of Jennings’ more grounded work. Connections can also be made with Michael Powell’s airy and romantic fusion of fiction and documentary in The Edge of the World (1937) – which similarly represents the end of a way of life but has a very different view of modernity – as well as such works as and Alberto Cavalcanti’s Coal Face (1935) and Carol Reed’s The Stars Look Down (1939). Cavalcanti’s documentary of heroic Welsh miners is of particular note here, as he was a mentor to Jennings and his experimentation with associative editing and sound provides an important precedent for Jennings’ later work. But Jennings’ films also share qualities and connections with other art forms and intellectual traditions. His fairly rigorous use of the locked-off camera links his work to photography. This technique also reappears in the work of his greatest contemporary acolyte, Patrick Keiller. Keiller’s opuses, London (1993) and Robinson in Space (1997), share Jennings’ preoccupation with contemporary Britain and its history, as well as fugue-like combination of associative images and sounds; though the droll and somewhat dry commentary that dominates Keiller’s work – partly fuelled by the “end of England” era of its production – is quite removed from the overall incorporative vision of Jennings. Although Jennings’ wartime documentaries are very much of their period, and share qualities and aspects of the bulk of British propaganda cinema of the era, they are also remarkable in many ways. This is partly a result of the team that Jennings commonly worked with, in particular the masterful editor Stewart McAllister, but is also the product of the director’s particular sensibility and background. Jennings could definitely be considered as something of a polymath. He was a brilliant student at Cambridge – part of the circle that included Malcolm Lowry, Kathleen Raine, William Empson and Jacob Bronowski, among others – a writer, painter, photographer (utilising the associative and surrealist properties of montage in mostly everyday settings), nascent sociologist, one of the organisers of the 1936 Surrealist exhibition in London, and a founder of the Mass Observation movement. He also had a deep knowledge of English culture and was fascinated by the processes and history of industrialisation – particularly the coming of the machine – in Britain. This preoccupation led him towards such subjects as the miners of Cwmgiedd and the posthumous publication of Pandæmonium (1985), his ambitious, Walter Benjamin-like collection of documents contemporaneously responding to the impact of the Industrial Revolution (6). Traces of many of these preoccupations and practices can be found throughout Jennings’ work, though it is possibly only his films that provide a truly synthetic, lasting and substantive legacy (7). Although often discussed as one of the great intellects of his generation, Jennings was also unable to focus on a single area or task throughout much of his life. It is only during the war, and his attachment to the Crown Film Unit, that he was able to find this structure and refine his work in a single field. It has also been said that Jennings looked down on cinema in comparison to his other artistic passions, but it is also true that the cinema, and his particular take on documentary as an inventive and rigorously actualised mode, offered him a combinatory form that brought many of his interests together. The Silent Village is one of the greatest and most integrated instances of such a fusion. Lindsay Anderson, “Only Connect: Some Aspects of the Work of Humphrey Jennings”, Imagining Reality: The Faber Book of Documentary, ed. Kevin MacDonald and Mark Cousins, Faber and Faber, London, 1996, p. 70. Kevin Jackson, Humphrey Jennings, Picador, London, 2004, p. 212. For evidence of this, see the short documentary discussing the cultural and historical importance of Jennings’ film to the people of Cwmgiedd in the “Wales on Air” section of the BBC’s website. Humphrey Jennings, Pandæmonium: The Coming of the Machine as seen by Contemporary Observers, ed. Mary-Lou Jennings and Charles Madge, Papermac, London, 1995. Geoffrey Nowell-Smith argues that it is only in the history of documentary that Jennings features as a “protagonist”. See Nowell-Smith, “Humphrey Jennings: Surrealist Observer”, All our Yesterdays: 90 Years of British Cinema, BFI, London, 1986, p. 321.